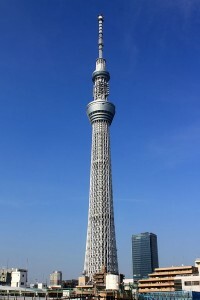 The world’s tallest tower Tokyo Skytree opened to the public this week. The broadcasting, restaurant, and observation tower uses some of the latest technologies developed by Japanese companies. Control device at tip: At the top of the tower (634 metres up) is a vibration control device which detects and balances out movements the tower makes in the wind to millimetre precision. It also does not need electricity. Strong antenna: The tower’s antenna will not budge in winds blowing up to almost 400 km/h. Super elevator: An elevator developed by Toshiba takes 50 seconds to transport people from ground level to the observation deck 350 metres above. It’s 10 times faster than the average apartment building’s elevator, and each elevator fits 40 people. Earthquake resistance: Central shaft made of reinforced concrete runs through the tower’s heart to give it extra strength. Lights: LED lights made by Panasonic use 60% of electricity conventional lights would use. For anyone wanting to visit the tower on their next trip to Japan, click here to go to their English website.